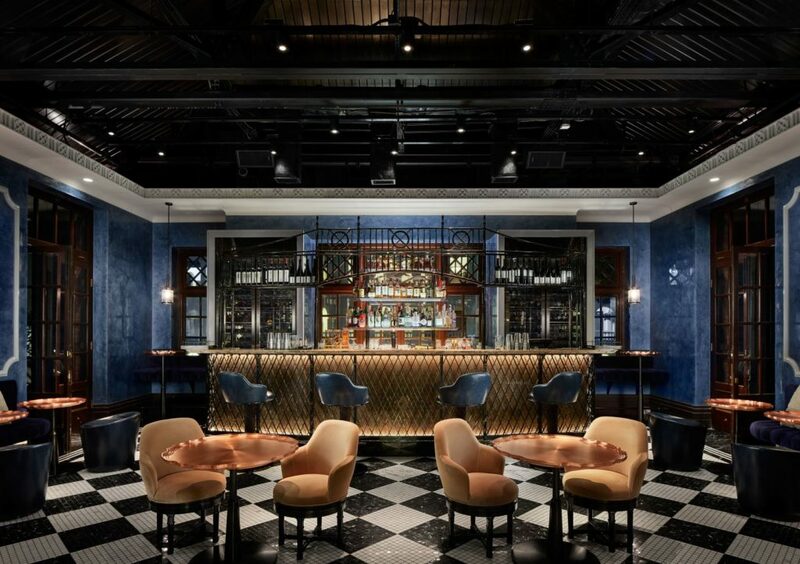 International design studio, AB Concept, has unveiled the interiors of Aqua Restaurant Group’s trio of new dining outlets in the former Central Police Station in Hong Kong. The three dining and bar destinations, named The Chinese Library, Statement, and The Dispensary, occupy the 7,500 square foot venue within the 100-year old former Police Headquarters. The renowned heritage site and former police station, which has been revitalised as the Tai Kwun Cultural Centre for Heritage & Arts, is the last cluster of iconic colonial buildings of this large scale in Hong Kong. The designers have reimagined the spaces with three distinct designs that marry the past life of the building together with the rich historical narrative of Hong Kong itself. Upon arrival, guests enter the space by walking up the grand iron-balustrade staircase, an original feature, passing double-storey circular windows that offer a lookout to the city streets that lay beneath. Situated on the top floor of the neo-classical old Police Headquarter building, which dates back to the mid-19th Century, the venue is divided into three areas. 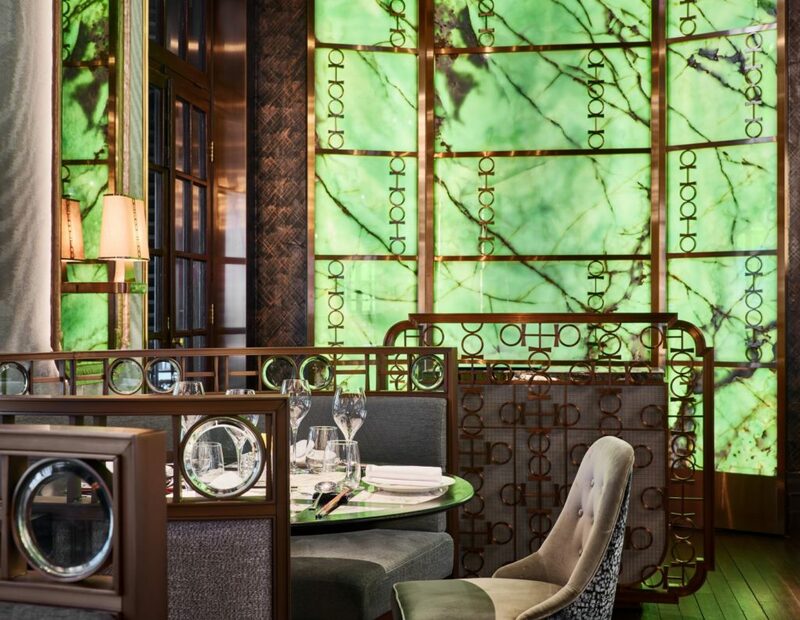 To the east is ‘The Chinese Library’, a restaurant conceived to reflect the historic influx of migrants from regions all over China, The Chinese Library’s menu pays tribute to the contribution each region has made to the colourful Hong Kong cuisine. To the west is ‘Statement’, a modern British restaurant paying homage to the colonial past. ‘The Dispensary’, an ornate lounge and bar connect the two restaurants in the middle. 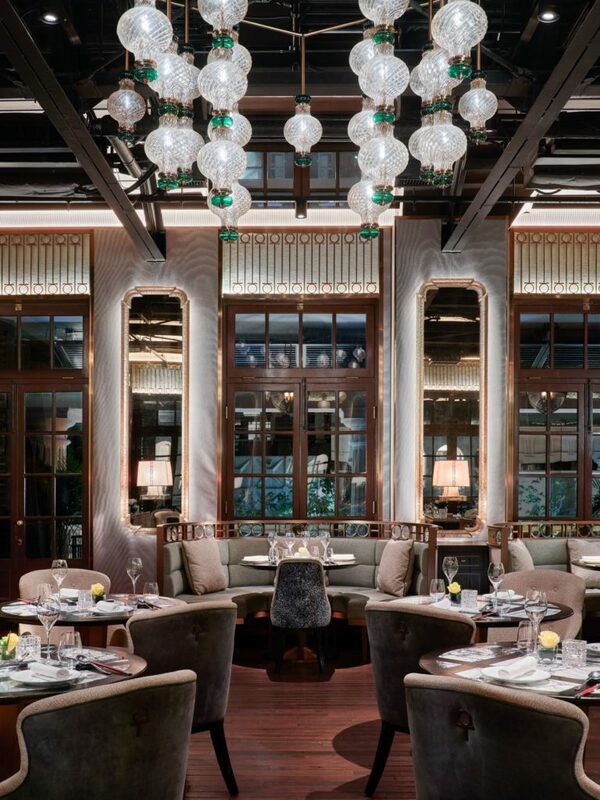 “By preserving and integrating some of the earliest architecture of the British colonial era into the new restaurant designs, we aimed to faithfully reflect the story of Hong Kong’s eclectic mix of Eastern and Western cultural influences”, commented AB Concept’s Co-Founders Ed Ng and Terence Ngan. “We envisioned the three spaces as elements of the whole experience in order for the distinct designs to flow cohesively. The unifying trait is, of course, the inherent colonial charm of the original structure, and it was an honour to delve into the past life of the building as Hong Kong’s Central Police Station”. Conceived to reflect the historic influx of migrants from regions all over China, The Chinese Library’s menu pays tribute to the contribution each region has made to the colourful Hong Kong cuisine. AB Concept retained the classic fittings, including doors and windows, and the original century-old wooden flooring in the grand dining room, which is a tasteful blend of Colonial and Oriental influences. Bespoke-crafted banquette booths with dimly lit mood lighting offer intimate seating with a library-like atmosphere, whilst draping chandeliers inspired by strings of Chinese lanterns hang from the original roof structure. Bronze, copper and celadon tones hint towards the illustriousness of Chinese jade in the colonial era. 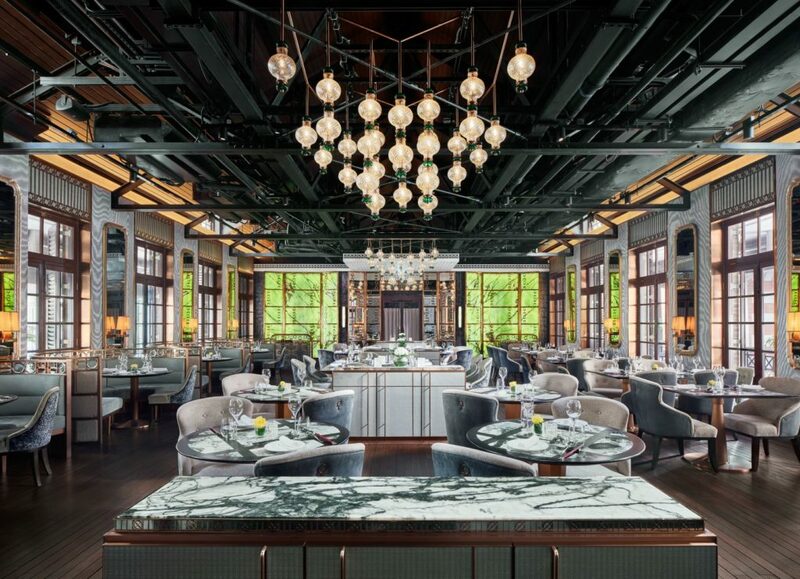 Jade-coloured walls featuring ornate gold mirrors, backlit green onyx screens, and black and white antique Chinese marble table tops bring the glory of a bygone era to light. Large colonial doors that open onto the expansive verandah reveal more of the building’s history, with balcony louvers echoing the traditional style of colonial window screens. As the name suggests, modern British restaurant ‘Statement’ hints light-heartedly towards the venue’s history as the police headquarters in Hong Kong. 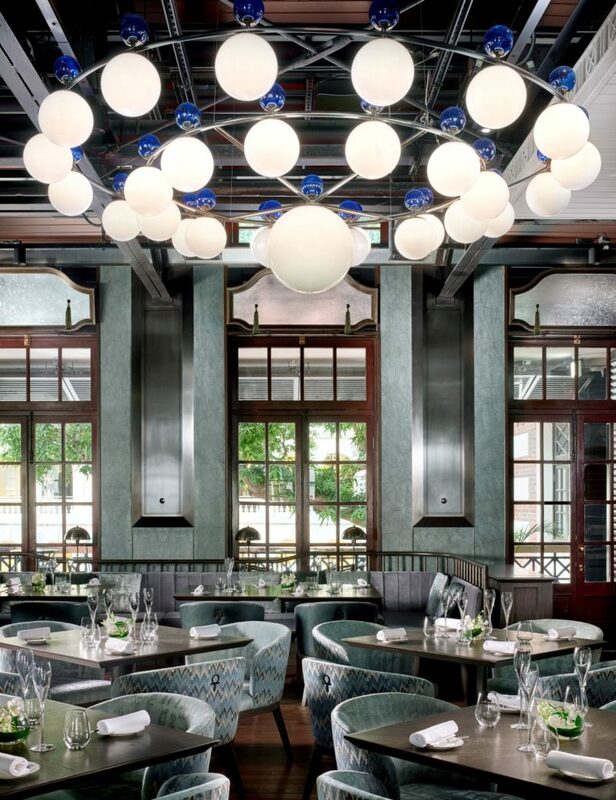 For the design, Ed Ng and Terence Ngan were inspired by avant-garde London culinary destinations, and thoughtfully blended this contemporary vibe with the original architectural features. 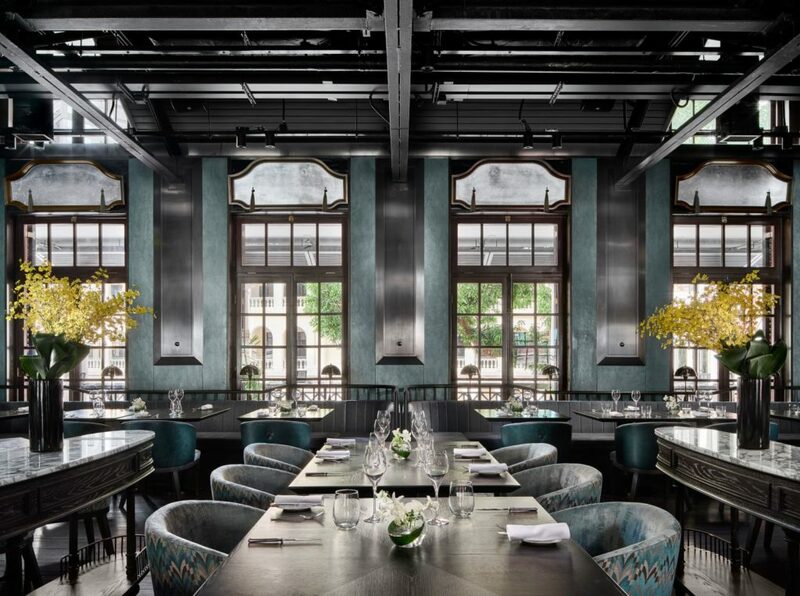 The original colonial pitched ceilings and full-length period windows bring an air of grandeur to the space, seldom found in restaurants in Hong Kong. Design duo Ed and Terence endeavoured to complement these traditional features with touches of contemporary glamour, including shimmering blue-green fabrics, bespoke milky-glass chandelier lighting inspired by British lanterns, and badge-shaped mirrors celebrating the historical significance of the space. Alongside the original century-old wooden flooring, and colonial shutters, the simple turquoise, cracked plaster walls, designed by AB Concept, maintain the sense of antiquity within the space. Infused with classic elements and modern nuances to the building’s law enforcement heritage, ‘The Dispensary’ is situated in what would have been the police headquarters’ mess hall. The walls are painted in the same dark blue used for the Hong Kong police uniforms, and are adorned with two specially designed mirrored shields, inscribed with historic tales of the building’s past. The signature black and white checked flooring is reminiscent of how the floor would likely have been in its former days as an off-duty bar for officers. Copper-tray table tops pay tribute to the official police plaque, situated around low-level lounge seating, whilst the bar itself is encased in a metallic fence resonant of the old police armoury.